I was slow to get started competing this year & have only done a handful of shows. I took the horses to Ravensdale for their first show, & it was good to be back jumping at this venue. Then we headed to Connell Hill & we won the 1.20 & 1.30 with the younger horses being clear in the 1m. Then we did 2 days of The Meadows Spring Championships. 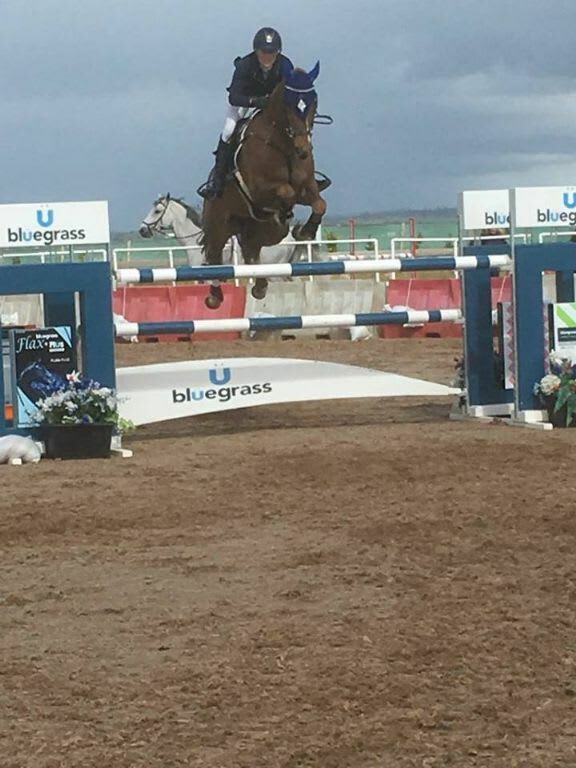 All of the horses jumped really well gaining many placings & Karmijn won the Top Oils Ladies qualifier. Last weekend we did Portmore Spring Championships held in the Bluegrass Arena. Again all horses jumped brilliantly being placed & qualifying the first day for the championships. Karmijn was 5th in the 1.20 Championship & Foesuela 4th in the 1.30 championship. Unfortunately the young horses didn’t get to contest the 1m championship as the arenas clashed. Plans for May shows include Barnadown for 3 days jumping, the first leg of the Ulster GP series & possible a show in England. I have put the horses onto Bluegrass Flax Plus & the farrier has just commended on how the foot quality has improved. I am very pleased with the results from combining Bluegrass stamm 30 & flax plus.